This necklace is layered with up to 4 discs. Choose from 4 different size discs, 1”, 7/8”, 3/4”, and 5/8”. 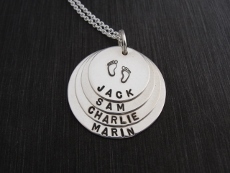 Each disc is stamped around the bottom edge, layered onto one jump ring then hung on a sterling silver cable chain. 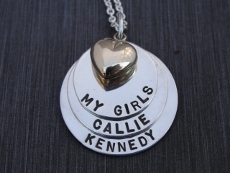 Choose footprints, a heart or a plain top disc and add one of our charms to add color or style to the necklace. Use names, initials, affirmations or a combination of all. If you would like the footprint or heart stamp please write your choice in the space provided for the smallest disc next to the name.